Since April, over 100 TONS of dead fish have washed ashore along the coast of four Central Vietnamese provinces. (This doesn’t count the dead fish still in the water.) Chemicals discharged into the ocean from a steel mill are the suspected cause. The economic hit on families due to the killing of the fish is tremendous. Why? Because people both eat from the sea and make their livelihoods from it. Not only is their food source depleted, but they can’t fish to sell to the market. Many are hungry. Orphan Voice is responding to this need. In the second quarter, you helped provide food to over 4,000 people – a total of 85,575 meals! Thank you! 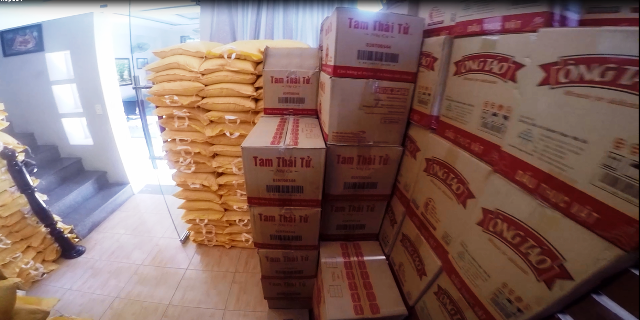 For the next 2 months, Orphan Voice will provide rice and instant noodles to distressed families affected by this disaster. Help us with your donation HERE. Han truly cares about people. In a way, she learned it from you. Your generosity provides her a place at New Beginnings School. Because YOU have loved her, she is loving others. Now that’s the best multiplication of them all. To support New Beginnings School for the Deaf, DONATE HERE. Or mail your gift to Orphan Voice, PO Box 910410, Lexington, KY 40591. Several years ago, Lai’s father left his wife to raise two children on her own. Lai’s mother remarried and had two more children with her second husband. But after the birth of the second child, Lai’s stepfather left. Lai’s mother was again on her own, this time with four children. 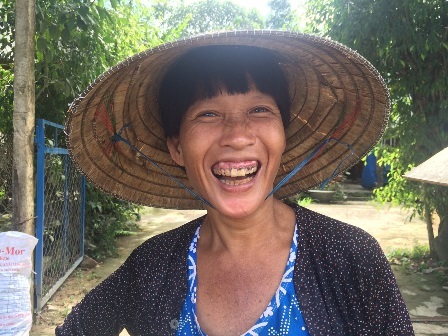 She began to farm to earn a living, but farming is hard work and it produces very little income. Unable to care for her family, Lai’s mother sought help. In July of 2010, Lai was welcomed into Promise House. Lai testifies, “When I first came here, everything was new and strange. Every child had a similar background, all gathering to stay in the same house we call Promise House. We are loved, cared for and helped intensively by the housefather and mothers in everything. I remember aunts and uncles from Orphan Voice bought me some necessary things for daily activities. And I went to a new school. “When I first came to Promise House, I had no feelings. Everything was strange. “Over time, things got better. I am no longer sad. Thanks to the love and encouragement of the housefather and mothers, I got used to the new life here. My friends at school loved me, cared about me and made friends with me. I started studying in a new class in a new school. Although I tried hard, I couldn’t keep up with my friends because I moved from the rural school to the city school. 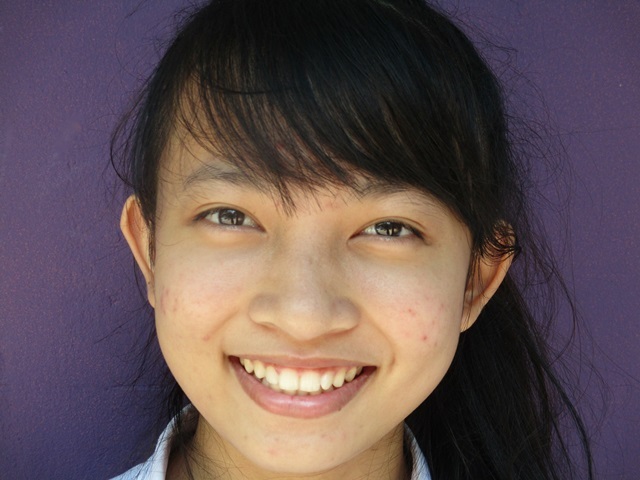 “At Promise House, my friends and I have the same daily routine. Every day, we go to school, come back home and think of games to play together. Children like Lai are restored, loved and nurtured because of you. When you give to Orphan Care, you are shaping her future. Indeed, you are living out James 1:27. Stand tall today. You are a hero. 50,000 Co Tu minority people live in the mountains west of the Orphan Voice office. The Co Tu live in small villages scattered throughout the hills and hollers. They speak a non-Vietnamese language, and express their distinct culture in unique dances, peculiar rites and living off the forest. They are also very poor. 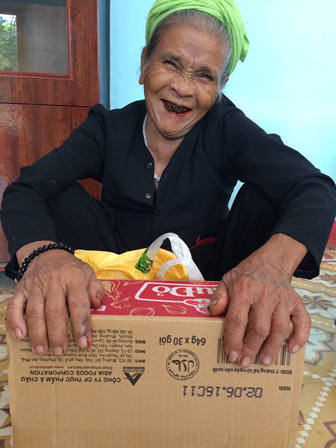 Recently, Orphan Voice, enabled by you, made several trips to Co Tu schools located in the Tay Giang and Nam Tra My districts to deliver 316 pair of shoes. They loved it! You can see why. The old green, plastic shoes are thin and torn. During this past winter, when temperatures reached 30 degrees at night, the cheap plastic hardened. It then became sharp at the edges and cut the children’s feet or rubbed painful sores on them. The shoes you provided, on the other hand, have a soft, padded heel and sole. Notice the difference. They’re made of cloth. No more cut feet! 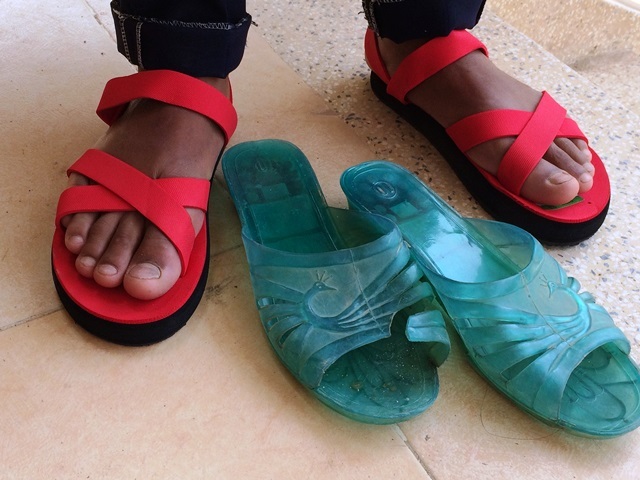 An added bonus is that the shoes you provided are attractive – especially important to the girls! You are preparing the way for a miracle in their lives. Thank you. For the next two months, we will deliver shoes to poor children in the mountains. We need your help to continue. To enable Orphan Voice to reach more of “the least of these,” donate HERE or mail you support to Orphan Voice, P.O. Box 910410, Lexington, Kentucky 40591. Over the years, Orphan Voice friendship teams and staff have made many work trips to rural boarding schools. The schools are much like orphanages because boys and girls leave their parents for months on end to attend junior and senior high school. The schools are centrally located in larger towns far, far away from the children’s rural villages. On such trips, we have dug wells so that children have clean drinking water. We have installed electricity and lights, built or repaired beds, put on roofs, delivered coats, blankets or mattresses, provided medical and dental care, brought supplemental food, and met a host of other needs. You’ve gone with us on every trip and been a part of each outreach and ministry to them. Thank you! 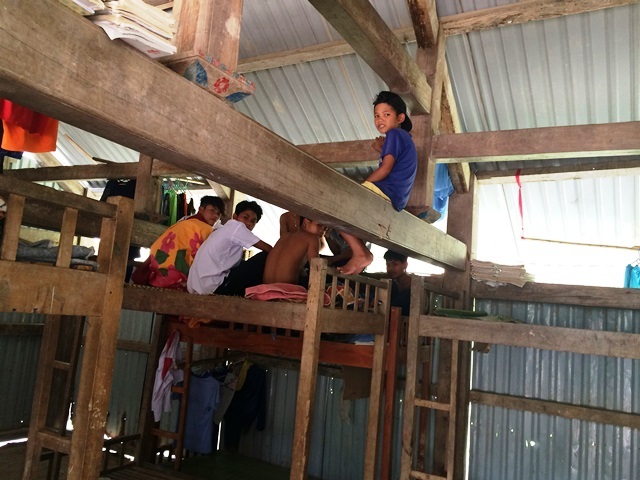 It might be hard to imagine, but these boys are waiting for school to begin. This is their “dorm.” In this Highlands area during winter, temperatures fall into the low 30s at night. What do you think? Do these boys need something better? “Yes!” And so, for the next several months, Orphan Voice will focus on these boys to ensure they have adequate living quarters, medical and dental care, and adequate nutrition. Your gifts make you a participant in changing their lives. Support Orphan Voice in our outreach to “the least of these”, by donating HERE, or mail your gift to Orphan Voice, P.O. Box 910410, Lexington, Kentucky 40591. Meet Bao. You’ve seen him before. 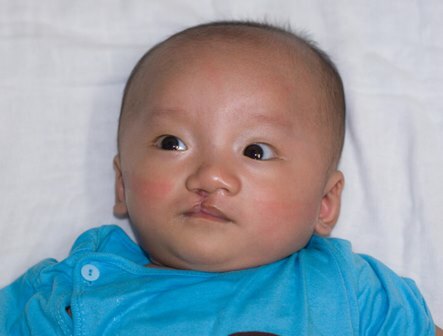 Bao was born in early 2015 with a severe cleft lip and palate to a poor family in the mountains of Vietnam. Orphan Voice worked to get him healthy enough for surgery, and in the summer of 2015, his cleft lip was repaired. As this newsletter goes out, Bao is in the hospital having his palate repaired! Thank you for making this possible. It costs on average $600 to have a cleft lip or cleft palate repaired. Can you provide one surgery? To do so, donate HERE, or mail your gift to Orphan Voice, P.O. Box 910410, Lexington, Kentucky 40591. Thank you! In April, CNN Hong Kong reported the dangerous plight of young Vietnamese girls who live along the Chinese border. “Lan” was out with friends at night when a boy drugged her at a café. When she awoke, she was in China, having been smuggled across the border and sold as a bride – for $3,000*. Here is the background to explain why Lan found herself in China. Because of China’s decades long, one-child policy and a strong cultural preference for boys, the numbers for marriageable-age males and females are skewed. There are not enough brides for young men to claim. And if they do find a Chinese bride, they must pay a large sum to “seal the deal.” To save money and make things easier, some young men choose to pay smugglers for a foreign bride. Lan was fortunate. 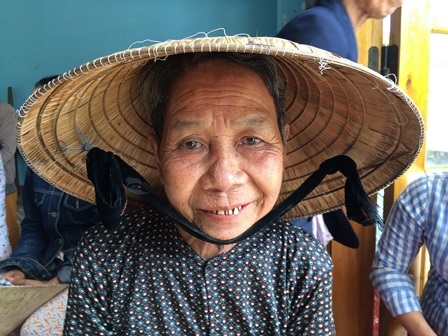 She never warmed up to her Chinese husband (as his mother thought she would) and she eventually made it back to Vietnam, along with two other Vietnamese girls who had also been trafficked but escaped. And it’s not always girls who are trafficked. In a Northern Vietnamese Province, due to the diligence and work of Vietnamese and Chinese police, 12 boys who were trafficked to China as babies have been returned to Vietnam. The search for these boys’ families continues, but it’s possible that they won’t be found. In the meantime, they need food, education, medical care, clothes and a safe place to live. You, Orphan Voice partners, are helping to support these boys. Thank you! You help to provide them a bed, daily food and needed medical care. And that’s not all you’re doing! 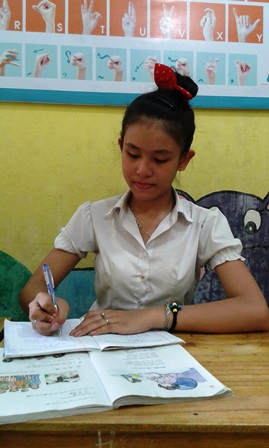 This quarter, Orphan Voice conducted seminars in school districts at high-risk for trafficking where 44 teachers representing 22 schools were trained and equipped in trafficking prevention. They, in turn, will “teach others also” – namely their students. When the teachers finish, 7700 rural students in this high-risk area will know how to recognize the wiles of traffickers, how to protect themselves from being trafficked and how to report to authorities if they are approached by a trafficker. Through this educational effort, you’ve saved some! That’s worth a lot! Orphan Voice’s work of educating and equipping rural, poor students, teachers and parents about trafficking prevention is ongoing. Our goal is to reach 300,000 students. To do so, we need your prayers and financial help. What would saving one child from this horrid experience be worth? That’s hard to say. To lend your helping hand, donate HERE. *Orphan Voice has knowledge of one young girl from our area who was also trafficked to China and sold as a bride. In her case, the price was $500. Given Lan’s price of $3,000, it’s possible that the $500 was paid to an intermediary and that she was sold again – for a higher price.